Len wouldn’t watch his own movie. Len is a spiky, angry former punk rocker turned hit pop producer, stewing in his infinity pool and his own self-loathing at his “country estate.” He listens to audiobooks of Western novels and watches old police shows on television. I doubt that he would watch Tim Godsall’s “Len & Company,” the fuzzy and unfocused indie drama that stars Len, out on DVD this month from IFC Films and available on Netflix. 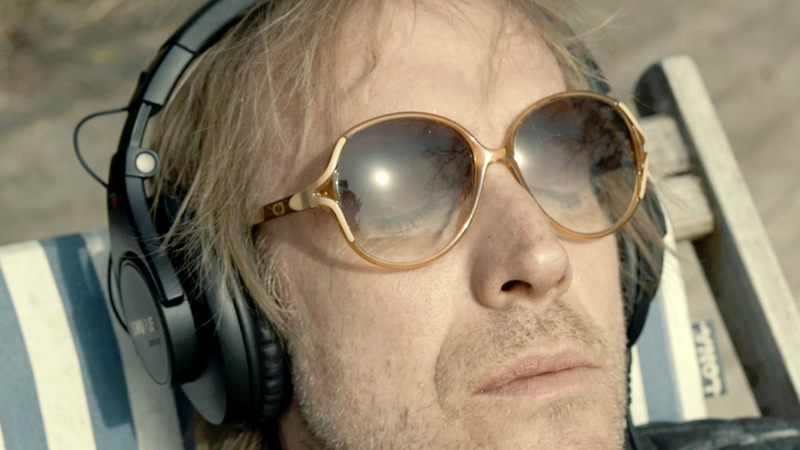 Len is played by Rhys Ifans, who is almost genetically incapable of not being interesting on camera, whether he’s playing a seething villain in Oliver Stone’s “Snowden” or another aging ex-rocker in Noah Baumbach’s “Greenberg.” When we first see Len, he’s tooling through the meadows in his sports car listening to Ian Dury and the Blockheads’ 1978 glam-punk hit “Hit Me With Your Rhythm Stick.” In his own way, he is as defiantly out of step with the times as any middle-aged dad. Also showing up at Len’s estate, conveniently, is Zoe (Juno Temple). a big pop star in the Lady Gaga vein. Len produced her big hits, but now Zoe is starting to feel trapped in the artificial celebrity bubble that she created, and is lashing out. Also showing up late in the film is Max’s mother, played by Kathryn Hahn, for no other reason than if you have the chance to put Kathryn Hahn in your movie, you take it. Godsall gives Len some comic business, such as a painfully frank speech about his checkered past at the local high school’s Career Day. Ifans brings the kind of fearsome, funny gravitas that the role needs. But the script by Godsall and Katherine Knight doesn’t give the cast much to do other than sit around, watch TV and wait for the epiphanies to start happening. Eventually they do, and it’s welcome to see Len’s sneering facade start to crack, a little. But, by this point, Len would have long since turned off the movie and plugged into one of his audiobooks.